One of the main reasons I love farming is that I love eating fresh food. I find that it generally requires little effort to make a fantastic meal when there is an abundance of fresh ingredients around to use. I usually don’t have the patience to follow a recipe, but really you don’t need a recipe for simple preparations. Tonight our meal was almost completely grown or made in Virginia. 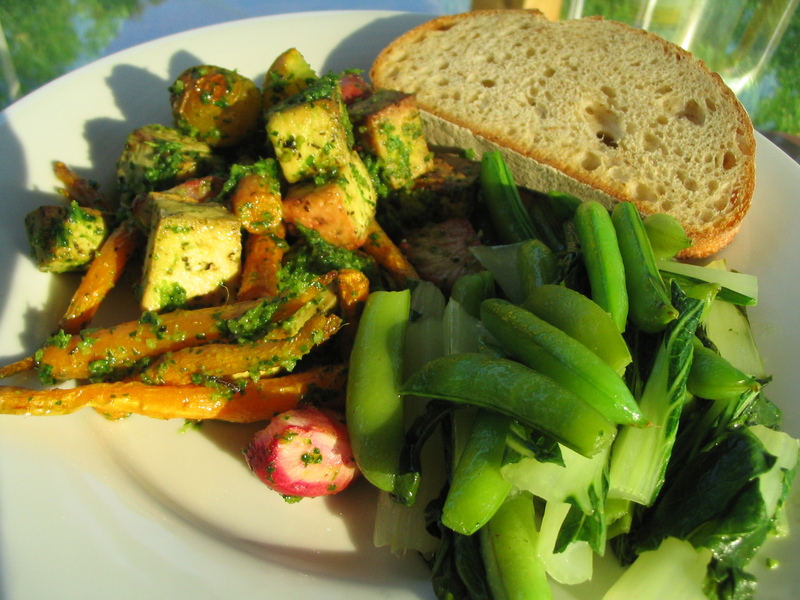 Roasted root veggies and tofu in parsley pesto, with sauteed veggies and a thick slice of sourdough. Simple and satisfying. From our farm: sugar snap peas, pac choy (greens), scarlet queen turnips, baby carrots, parsley, and new potatoes. From Louisa County, Virginia: Twin Oaks tofu. From a Lynchburg bakery: yummy artisanal bread. Not from Virginia: olive oil, garlic, parmesan cheese, walnuts, butter, salt. I roasted the turnips, carrots, potatoes, and tofu in olive oil at 425 degrees for about a half an hour. Meanwhile made a parsley pesto in the food processor of parsley, garlic, olive oil, salt, walnuts, and parmesan cheese. Mixed these together after the veggies were done roasting. Sauteed the pac choy and snap peas in olive oil and a bit of water for a few minutes. Toasted the bread. Dinner is ready!